Emma2CRM™ – What is it? 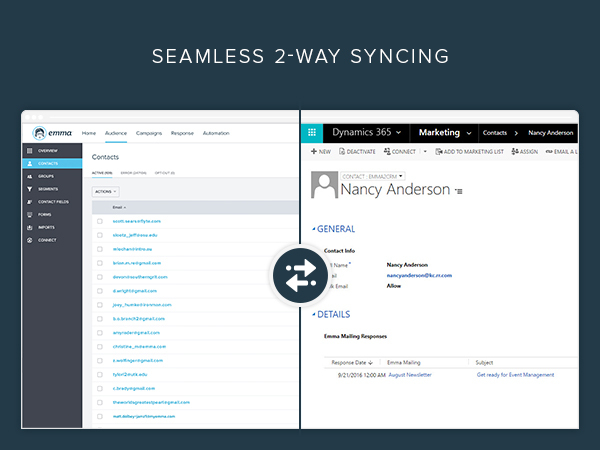 Seamless syncing from your CRM Contacts to your Emma audience keeps all your data current. 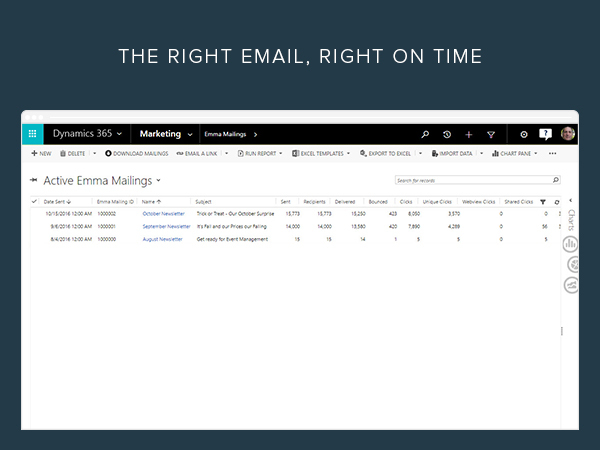 Track your mailing results in Dynamics CRM to quickly see who’s opening, clicking, bouncing or unsubscribing. Create a series of automated Emma emails that will be triggered when a Dynamics CRM Contact record field changes. Create Marketing Lists in CRM and automatically create corresponding audience Groups in Emma. View new email subscribers in Dynamics CRM. 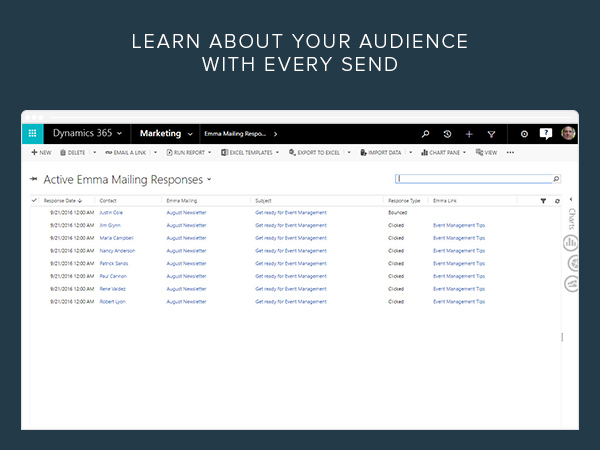 Track your mailing results in Dynamics CRM at the campaign and email recipient level. Create new Marketing Lists based on email responses recorded in CRM and publish to Emma as new audience Groups for more even focused mailings. Identify CRM Contacts that you want to add to you Emma audience by checking the Send to Emma field in the Contact’s Emma2CRM form. The Contact will be immediately added to the Emma audience list. Create a Marketing list in CRM (static or dynamic) and then click the Send to Emma button on the toolbar. This will create a Group in Emma for all those audience members. Once an hour the application checks to see if there have been any new mailings. If there are the system creates an Emma mailing record in CRM which will accumulate the totals of all the different Emma responses. Once Emma responses are coming into the Emma system, the application will periodically throughout the day retrieve the latest interactions – bounces, open, unsubscribes, clicks to create Emma Response records in CRM. These records will be associated with the Contact person and the Emma mailing record. Marketing managers can review the overall performance of any mailing including which links were clicked on and by whom. CRM users can view the history of emailing activity for any or all of their Contacts. We support Dynamics CRM 365 online or on premise CRM 2015, 2016, IFD/ADFS environments. View new signups in Dynamics CRM. 1. What versions of Dynamics CRM support Emma2CRM? Emma2CRM is a managed solution and works with Dynamics 365 – all current versions, CRM On Premise in ADFS mode for version 2015, and 2016. 2. Which versions of Emma does Emma2CRM work with? Emma2CRM works with Pro, Plus, Premium, Enterprise and the Agency edition. 3. How is Emma2CRM licensed? Emma2CRM is licensed at the CRM organization level on an annual subscription basis based on the number of Contacts in the Emma account. 4. What is included with the annual subscription? The annual subscription includes unlimited integration of all Emma mailings, free telephone, chat, email support along with no charge for any product maintenance fixes released during the term of the subscription. 5. Will I be charged based on the number of enabled CRM users? No, Emma2CRM is site licensed based and it doesn’t matter how many CRM users view your Emma2CRM data. 6. How long does it take to setup Emma2CRM? A provisioning session runs about 45 minutes. During that time via a screen share, you will be walked through the setup and configuration of the system. 7. Is my data stored on any third party servers? No. The Emma2CRM integration uses a direct connection between your CRM system and your Emma account. No information passes through any servers or cloud computing devices. All your data stays in CRM or Emma. 8. Will the Emma2CRM managed solution break my CRM customization? No. The managed solution is set up so it doesn’t come with a Site Map and comes with its own Contact Form and Marketing List form. It does make changes to the Marketing List Entity with the addition of a Sync to Emma button and creates a relationship between the Contact entity and the Emma Mailings entity. 9. How do CRM Contacts records get published to Emma? A Send to Emma check box is visible on the custom Emma2CRM Contact form. When that box is checked the Contact record is added to the Emma system. 10. How are groups created in Emma? After creating a Marketing List of Contacts that should get a mailing, just click on the Sync to Emma button on the Marketing List record toolbar and a list in Emma will be published with the members. 11. How often do I need to sync a Marketing List to Emma? Every time you want to do a mailing using that list it should be synced to Emma to make sure it is totally up to date. 12. What types of Marketing Lists does the integration support? The integration supports both Dynamic and Static lists made up of Contacts. 13. How frequently are mailing responses created in CRM? The application retrieves email responses for mailings from Emma and creates the corresponding record in CRM for the first 7 days using a daily frequency schedule that the Emma2CRM administrator can configure. From day 8 to day 30 there is a user set frequency and then another one from Day 30 to Day 180. 14. 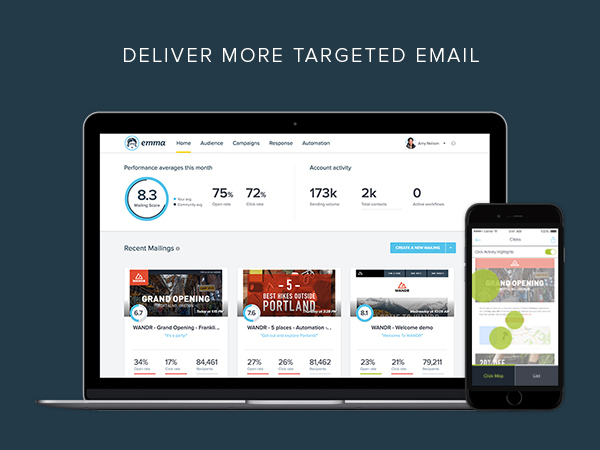 What happens when an email recipient opts out of all mailings? The Emma2CRM integration will update the Do Not Bulk Email bit in the Contact’s record to Do Not Allow. 15. Will I know what links users have clicked on? Yes, Emma link clicks with the name of the Link are created in CRM that associate the click record to the Emma mailing and the Contact record. 16. What security roles are needed to use Emma2CRM? The person installing the managed solution needs to be a CRM Administrator. Other CRM users that would like to view Emma mailing information can be assigned either the Emma2CRM Read Only or User Role as required. There is also an Emma2CRM Manager role for a person that needs more privileges but isn’t a CRM Administrator. 17. The application sounds very powerful but is it simple and straightforward to use? Yes, it is! CRM Innovation has been building integrations between Dynamics CRM and other applications since 2007 and we have figured out how to make them work really well. 18. What happens if I don’t renew the annual subscription? All integration between the two applications will stop. 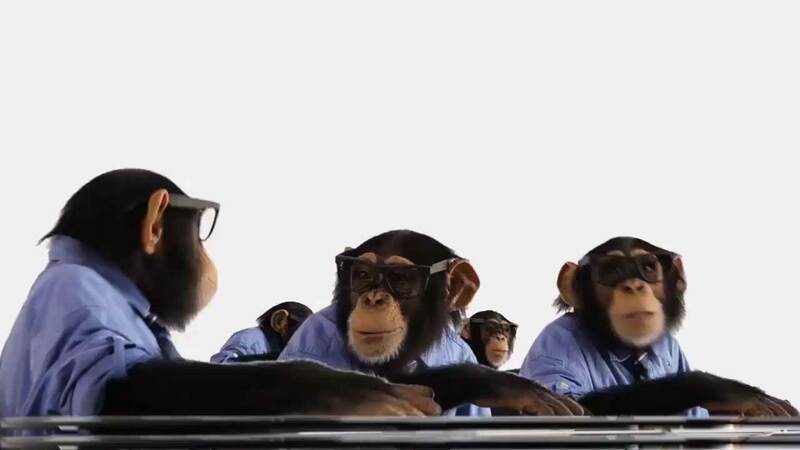 You can keep the managed solution in your CRM system and retain all the historical data but no new data will be added. 19. Do you offer a trial? Not at this time. But we do deliver full function demonstrations of the live product for your marketing team. 20. We have an agency edition; does it work with that version? Yes, the Emma2CRM integration is designed so that a customer’s CRM organization can connect directly to their (sub) account in the agency edition. 21. Can I connect Emma2CRM to more than one CRM or Emma account? No. The system is designed to allow only a single pairing between one CRM organization and one Emma account. For example, you cannot have one CRM organization connected to multiple Emma accounts in a scenario where ‘business units’ in CRM maintain their own Emma account. 22. What if I need Emma2CRM for our dev or test environments? We will provide you at the time of the provisioning session managed solutions for the other environments so they will look the same as the production organization. However, they will not be connected to the Emma system. 23. Will Emma2CRM work with my on-premise CRM system if it isn’t setup in an Internet Facing Deployment (IFD)? No, your CRM system must be accessible outside the firewall in an ADFS/IFD configuration. 24. How do we purchase Emma2CRM? CRM Innovation has developed the solution for Emma and provides all sales and support. If you want to purchase the application, you will be sent an invoice that you can either pay by check or online via credit card. Billing is once a year for the 12-month term, paid in advance. 25. What happens if I am already using CRM and Emma and I then implement the Emma2CRM integration? We have two applications that are run separately as part of the provisioning process to bring your CRM and Emma contact lists into sync. Note: Additional organizations in a multi-tenant environment require additional licenses. The same applies to licenses for development/training/test environments. Additional organization licenses are 1/2 the price of the production license. All of these Components and Manuals are provided at the time of subscription. If you have an interest in taking a look at them during the pre-sales process, just reach out to us via chat or the Contact Us form.